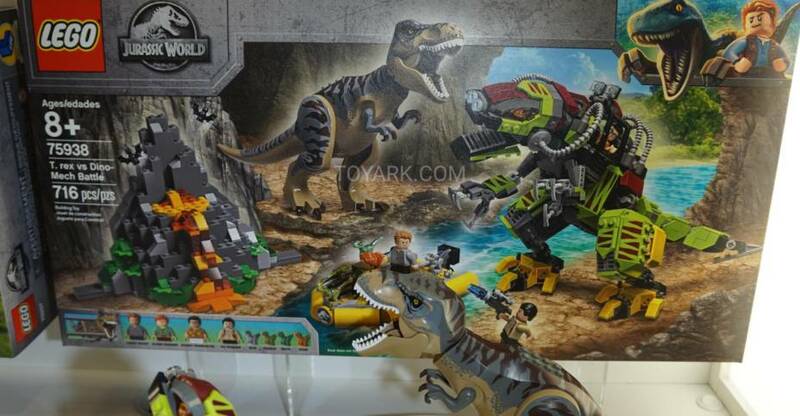 This mixed gallery from Toy Fair 2019 includes LEGO sets for DC Comics, Marvel comics, Jurassic World and Minecraft. 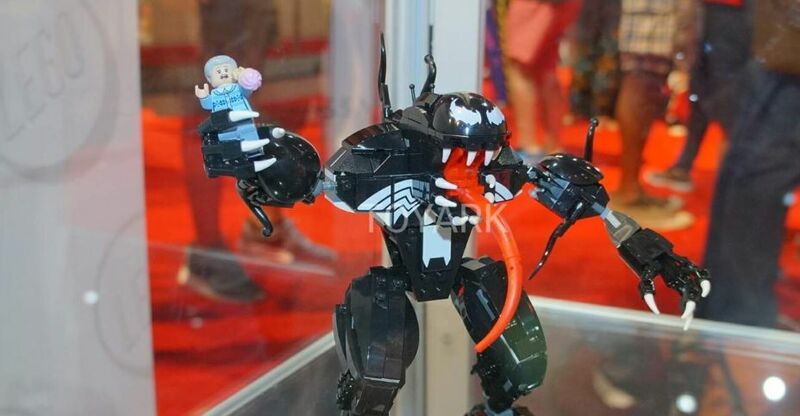 Check out the LEGO Marvel and DC Super Heroes on display at San Diego Comic-Con 2018. BURBANK, Calif., Feb. 2, 2017 /PRNewswire/ — Warner Bros. Consumer Products (WBCP) unleashes a DC Super Hero takeover with its roster of global licensees and partners during Toy Fair 2017 season, including International Toy Fair Nuremberg (February 1–6) and International Toy Fair New York (February 18–21). Highlighted by DC franchises, including tentpole event films Wonder Woman, Justice League and the soon-to-be-released The LEGO® Batman Movie, as well as the groundbreaking DC Super Hero Girls franchise, and hit animated series Teen Titans Go! and Justice League Action, WBCP’s pop culture-inspired and fan-favorite offerings will include toys, collectibles, costumes and more. “With collections and must-have products from the most anticipated films of the year, we’re excited to showcase the full breadth and scope of WBCP’s DC Super Hero offerings in partnership with our super-powered global partners, programs and products at Toy Fair this year,” said Pam Lifford, President, Warner Bros. Consumer Products. Wonder Woman hits theaters around the world in her first-ever standalone, self-titled action adventure feature film, beginning on June 2. The much-anticipated epic delves into the Amazonian Super Hero’s origins and her fight in a war to end all wars. 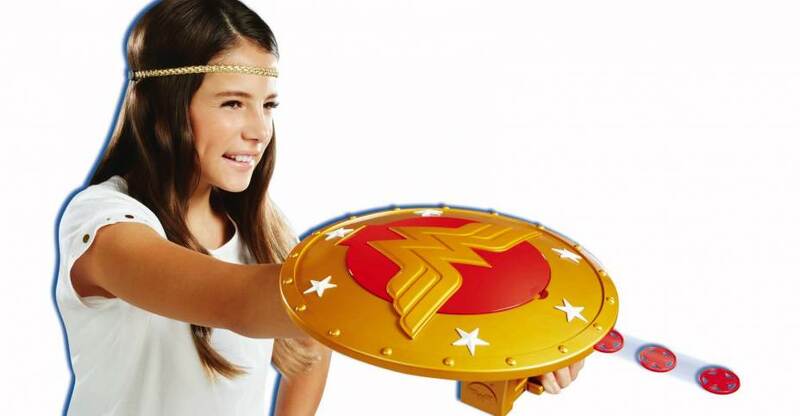 In continuation of Wonder Woman’s 75th anniversary and in support of the upcoming film, Warner Bros. Consumer Products and its partners created a line of products fit for Wonder Woman fans of all ages. Global master toy licensee Mattel will unveil product from the powerful line of toys to accompany Wonder Woman’s first-ever solo feature film, including a full toy line created in the likeness of the movie’s characters, collectible figures, dolls, playsets and role play for fans to recreate their favorite scenes from the movie. The Wonder Woman feature will also be supported by global partners The LEGO Group with an exciting construction set inspired by adventurous moments from the film, and Rubie’s Costume Co. with a new line of Wonder Woman movie-inspired costumes and accessories for fans of all ages. Additional licensees with toy offerings include Funko, with fan-favorite stylized collectible figures; Neca, with 18-inch replica figures; Tonner Dolls, with detailed-design 18-inch fashion dolls; Madame Alexander, with 11-inch fashion dolls; Hot Toys, with highly detailed collectible figures; Kotobukiya, with high-end collectible statues; Mezco and QMX with stylized figures; Jada Toys, with mini-metal figures; Schleich with collectible figures; Sakar International, with electronics and accessories; and many more worldwide. A global cultural phenomenon and a treasured icon of power, strength, justice, love and peace, Wonder Woman also comes to life in Warner Bros. Pictures’ forthcoming action adventure Justice League, and stars in DC Super Hero Girls, the fun, multi-level brand which showcases some of DC’s most famous female Super Heroes and Super-Villains as teenagers. From the core comic books and the brand-new Justice League Action animated series, to the upcoming explosive feature film, the Justice League universe has no limits and invites fans of all ages to be part of the world’s most recognizable Super Hero team: Batman, Superman, Wonder Woman, Aquaman, The Flash and Cyborg. Already touted as one of the most eagerly awaited films of 2017, Justice League will inspire a global program fit for the biggest Super Heroes in the world as they arrive together for the very first time on the big screen November 17. WBCP will roll out a massive global merchandise program that will feature the fan-favorite DC Super Heroes in a myriad of toy lines and programs, bringing the film to life for collectors and kids alike. Global master toy licensee Mattel will be developing an empowering line, including action figures inspired by the most iconic Super Heroes and Super-Villains, playsets, vehicles, collectible figures, and will introduce a full line of action role-play toys highlighted by the much-anticipated Multiverse™ line, which captures the superior accuracy and details of the film’s characters. Also supporting Justice League is global partner The LEGO Group, with exciting construction sets inspired by memorable scenes from the film, and Rubie’s Costume Co., with a full range inspired by the Justice League feature film, including costumes and accessories for kids and adults. Additional toy partners supporting the film include Funko, with a Justice League collection of stylized figures; Jakks Pacific, with their popular large-sized collectible figures for this epic action-adventure; Jada Toys, with metal figurines; and many others around the world. The new family-friendly animated adventure from director Chris McKay and the team behind the blockbuster hit The LEGO Movie, The LEGO Batman Movie will stand a brick above the rest in the LEGO showroom at International Toy Fair New York as WBCP and The LEGO Group display more than 10 original construction sets recently launched at retail. Designed for kids, kids at heart, and collectors, The LEGO Batman Movie collection includes 18 LEGO construction sets as well as a full line of 20 exclusive minifigures, featuring exclusive versions of characters from the film. 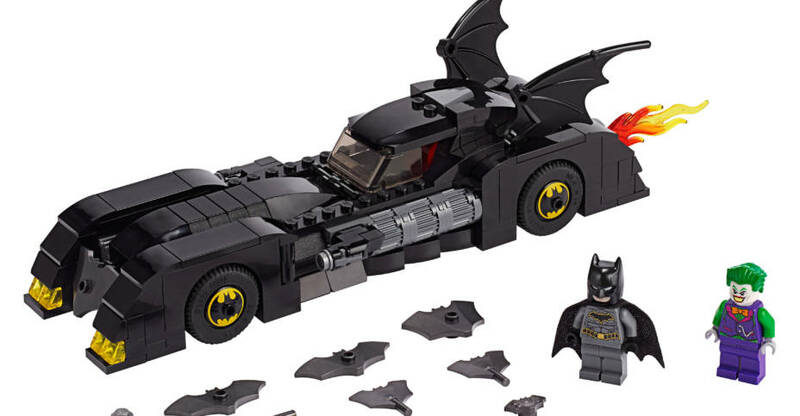 Fans can also build on iconic environments and moments from the film with The LEGO Batman Movie: The Batmobile set, which lets fans rev up hours of fun racing through Gotham City or smashing through any obstacle in The Dark Knight’s way; and The LEGO Batman Movie: Batcave Break-in set, which invites fans to defend the Batcave from The Penguin, utilizing a range of Batsuits that allow them to take on Super-Villains via air, land or sea. Additionally, all-new LEGO BrickHeadz based on Batman, Robin, Batgirl and The Joker from the film will launch in March. The LEGO Batman Movie crashes into theaters beginning February 10, 2017. With many accolades and multiple award nominations for 2017, including “License of the Year,” the DC Super Hero Girls licensing and merchandising program from WBCP and DC Entertainment continues to expand and empower girls to reach their own heroic potential. Harnessing the power of the world’s most iconic female Super Heroes and Super-Villains from the DC Universe, DC Super Hero Girls follows Wonder Woman, Supergirl, Batgirl, Harley Quinn, Bumble Bee, Poison Ivy, Katana and many more, during their formative years, as they learn about teamwork, friendship and to hone their super powers as teenagers and in a high school setting. Soaring into the New Year with all-new action-packed collections, DC Super Hero Girls continues to engage young fans with original content and product across multiple categories, offering kids even more chances to play, watch, read and be inspired to discover their full potential. Featuring products that remain consistently in-demand amongst consumers and retailers alike, WBCP and master toy partner Mattel offer fans all-new Action Dolls, Action Figures and Action Role-Play toys from the beloved DC Super Hero Girls collection, with a new rollout of characters, along with new vehicles and gadgets, slated for Spring and Fall 2017, as girls can play out the narrative of their favorite teenage DC female Super Heroes and save the day. The DC Super Hero Girls’ Mattel collection features the industry’s first-ever 6-inch action figures designed for girls, the first 12-inch collection of action dolls featuring strong, athletic bodies that stand on their own in heroic poses. In 2016, the Mattel toy line has also received much recognition, including a TOTY nomination in the Action Figure category for the DC Super Hero Girls Action Figures. The LEGO Group assembles a strong offering, capturing the empowering characters and storylines in six original construction sets for kids around the world to imagine their super building powers as they play and recreate action-packed moments together with their favorite DC Super Hero characters. LEGO® DC Super Hero Girls sets include Batgirl Batjet, Harley Quinn to the Rescue, Super Hero High School, along with the recently released sets of Lashina Tank, Bumblebee Helicopter, and Wonder Woman Dorm Room, allowing fans to build on non-stop fun and adventure. Additional global partners include Rubie’s Costumes, with its girl-power collection of costumes and accessories; Funko, with must-have stylized, vinyl figures; and many others. WBCP and Mattel join forces to provide fans with two new lines in support of the hilariously-fun hit animated series Teen Titans Go! and the power-packed Justice League Action. These toy lines capture the action, fun, humor and personalities of the DC Super Heroes with action figures, core characters and vehicles inspired by scenes from the all-new animated series infusing both heroic storylines from Justice League Action and humor throughout the toy line from Teen Titans Go! Teen Titans Go! follows the hilarious adventures of Super Heroes Robin, Cyborg, Starfire, Raven and Beast Boy and showcases the comedic chaos that ensues whether they’re fighting crime or fighting each other for that last piece of pie. The Teen Titans Go! program also includes a collection of fan-favorite Funko figures, featuring a lineup of these wildly funny Super Heroes. WBCP also continues to support a strong DC TV slate with The Flash, Arrow and Gotham; its fan-favorite franchises including Harry Potter and Fantastic Beasts and Where to Find Them; classic animation brands such as Scooby-Doo and Looney Tunes; hit TV series like The Big Bang Theory; and many more properties and groundbreaking content rounding out the Studio’s unrivaled portfolio. Here is the LEGO display from New York Comic-Con 2016. they had a major focus on DC Comics themed sets. Included are numerous sets and minifigs from LEGO Batman The Movie and LEGO DC Super Hero Girls. 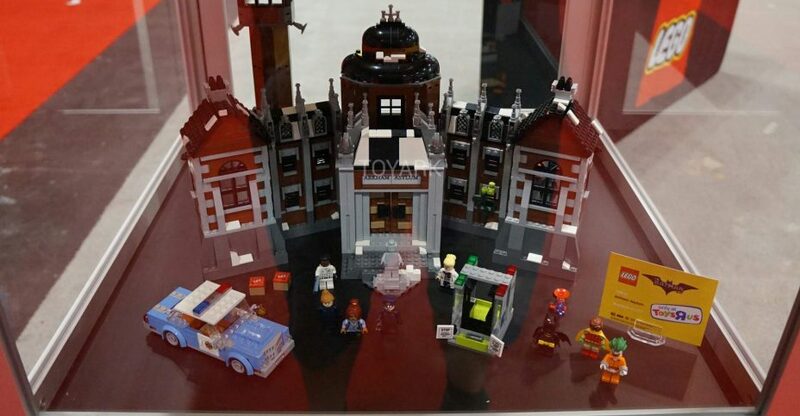 Here are the LEGO DC Comics sets on display at Toy Fair 2016. Here are the photos of the LEGO DC Comics Super Heroes display. These images come from San Diego Comic-Con 205’s Preview Night. All times are GMT -4. The time now is 2:46 AM.